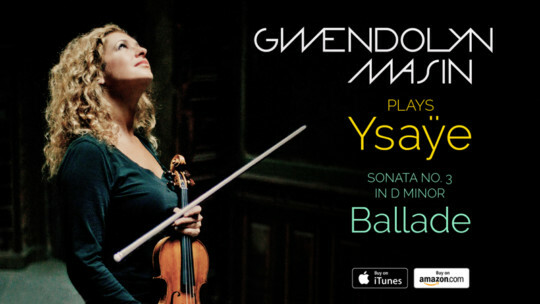 The drama of violinist and composer Eugène Ysaÿe’s work is mirrored in Gwendolyn Masin’s intense and considered performance. She not only interprets the Ballade but is in dialogue with its very essence – the telling of a story, the crafting of a narrative. Masin plays Ysaÿe with fervor and zeal, delves into the melancholy, spectacle and virtuosity of the music. The technical challenges which Ysaÿe’s work poses are but a subtlety for listeners – and Masin – who’s playing holds one’s attention in suspense with daring, fantastical and profound thought. She transports her audience to a mysterious realm filled with reverie, opening the door to the imagination. The music goes beyond its genre, no longer just classical music, but autonomous music; more than an expression of personality, it is an expression of spirit. The Ballade is available at Naxos and digitally on most platforms.